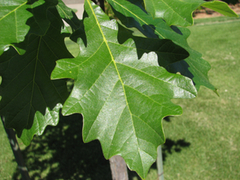 Leaves: The scientific name bicolor refers to the two-colored leaf on this oak. The upper surface is dark green and the underside of the leave is slightly white with a fuzzy feel to it. Leaves are 4 to 7 inches long, margin with large irregular blunt teeth, 2 to 4-1/2 inches wide. 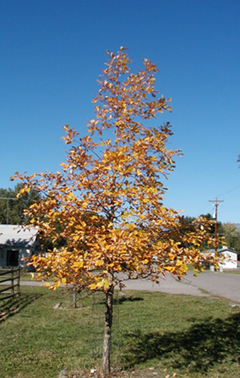 The fall color can be yellow-orange with leaves turning brown and somewhat persistent on the tree through the winter. Twigs: Flaky or scaly, hairless, end buds are chestnut brown, small, blunt. Fruit: Acorn, ½ to ¾ inch long single or double on a 1 to 4 inch stalk, tan in color with slightly fringed cap that covers up to one-third of the acorn. 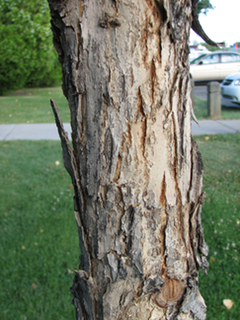 Bark Light brown to gray, flaky or scaly. Landscape Value: This tree is naturally found on moist low lying sites. However, it can tolerate poorly drained or compacted soils typical in Colorado. 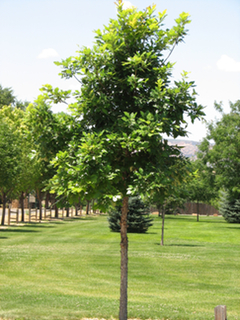 Tree is propagated by seed so it is important to know about the seed source (i.e., tolerant of alkaline soils). Not very common in the nursery trade, but definitely worth planting if a reliable nursery source is located. 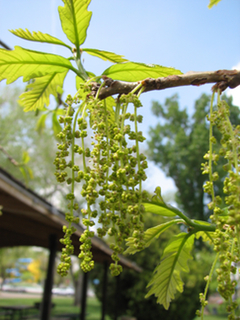 Insects and Diseases: No major pests on this tree in Colorado.